A brand new bush type for 2015 and the beautiful rose is in memory of Lynda Bellingham. 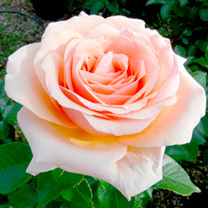 Stunning soft peach with apricot and amber shades with mid-green glossy leaves. Strong compost bush rose perfect for beds, borders and large pots. Light but spicy perfume. Height 71-80cm. Flowers June-early November. Scent 5. Hardy perennial variety.